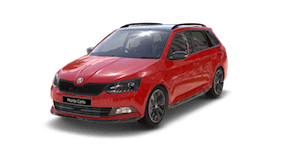 Fabia Monte Carlo Wagon provides the perfect blend of sporty aesthetics and striking design. It is highlighted by its black design elements such as 17” black alloy wheels, black front grille, black door mirrors, sports seats and panoramic glass roof. Features such Front Assist with City Emergency Brake, SmartLink smartphone connectivity with Apple Carplay and Android Auto, rear view camera, Multi-Collision Brake and Green Tech (Start-stop and brake energy recuperation) as standard across the range. The last thing we want to happen to you immediately after an accident - is another accident. Electronic Stability Control (ESC) helps you maintain control of the car if it begins skidding, while Multi-collision Brake◊ activates the braking system to help minimise any future collision. Our clever engineers have developed a hands-on approach to help identify driver fatigue. Fatigue Detectionâˆ†◊ monitors your movement through the steering wheel. If it senses signs of fatigue, it trigers an audible and visual warning, alerting you to stop and rest. You know what else sounds great? Every FABIA MONTE CARLO Wagon features ŠKODA Surround Sound, developed in collaboration with leading audio brand Arkamys, with six speakers as standard, a unique acoustic compensation system, and a Virtual Subwoofer to enhance digital audio. The FABIA MONTE CARLO Wagon is packed with clever features for a rainy day. Light Assist automatically adapts to changing light conditions, while the Rain Sensor∆ automatically adjusts the speed of the wipers to light or heavy rainfall. Black won’t be going out of fashion any time soon thanks to the FABIA MONTE CARLO Wagon. Highlighted by its black design elements, such as the 17” alloy wheels, front grille and door mirrors, it also features a panoramic glass roof with a sunshade to deliver plenty of daylight into the interior. The front spoiler, rear diffuser and tinted windows all add to its sporty appeal. We’ve packed plenty of clever features into the FABIA MONTE CARLO Wagon, but still left plenty of room for your luggage. Enjoy 505 litres of space, expanding to a whopping 1370 litres with the rear seats folded down. When you buy a FABIA MONTE CARLO Wagon, you’re making a smart choice — for yourself and the environment. Green Tech~, standard across both petrol variants, features “Start Stop” and Brake Energy Recuperation. "Start Stop" automatically switches the engine off when stationary and starts it again when you want to drive off.